As I was frying some of my leftover tuna patties from the freezer this morning, I found out that these don’t keep all that long. Either that or I need to fully defrost them before frying them because they totally fell apart when I cooked them this morning. Thankfully, I was still able to get them into the bento box and they still tasted yummy. Today I made a pair of pink panda girls. Sadly, I only noticed that I put the face of the front one on crooked when I started eating lunch and by then it was too late to retake any photos. Her poor ear looks all droopy! 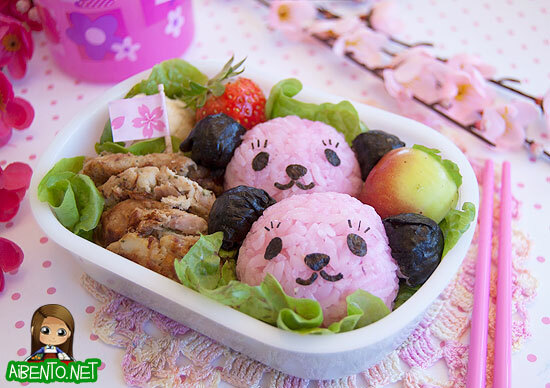 I made the rice pink by using hanaosushi no moto, which is a pink vinegar powder that you mix in with hot rice. To those of you who haven’t tried this before, take my advice and never, ever mix this and let the steam go into your nose!! I wanted to know what it smelled like when I was mixing it and boy did I get a surprise. Since it’s powdered vinegar, the steam packs a mean punch and you’ll start coughing and choking immediately. 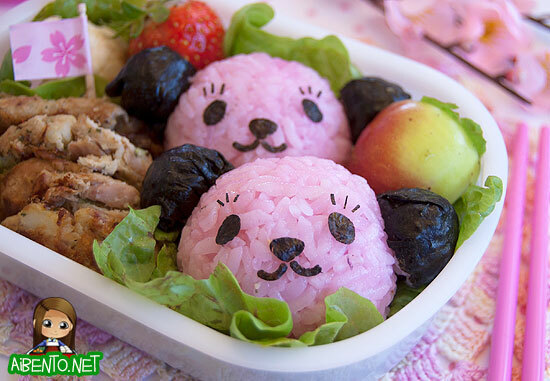 Singed nose hairs and no plan at all aside, this was a fairly simple bento. I used plastic wrap to shape their heads and ears, then wrapped the ears in pieces of nori that I wet with water to curve to the shape of a small ball. I used the Chuboos punch for the eyes, nose, and mouth, but cut the eyebrows with a scissors. Here’s a closer look at the onigiri. For dessert, I added half a lady apple, a strawberry from our garden that the birds miraculously hadn’t seen yet, and a piece of cauliflower. I used the toothpick that I used for placing the facial features as a pick by putting a piece of sakura mini tape on it. I bought this one at J-Box, but I also found the exact same one at Don Quijote (town store), along with a clover one which will be great for St. Patty’s Day bentos. I have to admit I’ve been slacking on keeping track of my dinners and sometimes my whole days, especially during the weekend! I have to get myself back on track or my weight loss is going to take quite a bit longer than I’d wanted it to!